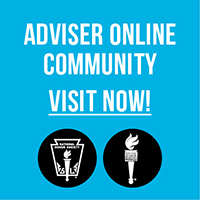 Student program advisers have a wealth of experience and expertise. We encourage you to share your knowledge by writing for Advise magazine. Review the topics below and submit your article to advise@nassp.org. If there is another topic you would like to write about, please use the same email address to contact us. You can also view the submission guidelines. Describe best practices and exemplary programs objectively and include evidence of success, as well as a discussion of barriers or problems. Address replicability and provide details about planning and process. Include research as appropriate and necessary. Explain how advisers can act on the information. Include tips, advice, resources, and examples for sidebars. Offer opinions on some topic of professional interest to advisers. Manuscripts should be no more than 2,000 words, but may include additional supplemental material. Successful manuscripts are written in a tone and style appropriate to a magazine; are well-organized; clearly establish the purpose of the article; use specific examples-it is best to show, not tell; summarize relevant research succinctly; and adhere to the rules of grammar. The manuscript prepared in MS Word. A cover letter that indicates your intention to submit the manuscript to Advise magazine and stipulates whether the manuscript has been submitted elsewhere. Contact information for each author: affiliation and title, mailing address, telephone number, and email address. A two-sentence author identification for publication. The first sentence should include a current title, affiliation, and email address; the second sentence should highlight key accomplishments or reinforce your authority in discussing the topic. If you’d like to send photos to accompany your article, please attach the JPEG files to an email and send them to advise@nassp.org. (Photos should be at least 4″x6″ at 300 dpi or better.) Include a photo credit and a brief caption that identifies the school and the context. NASSP does not identify individual students and does not require release forms. If no photos are available, NASSP will select file or stock art to enhance the article. If you use an extended quotation (including charts, graphs, and tables) from another publication, you must obtain written permission from that publisher before submitting the manuscript to Advise. This permission must accompany the manuscript and be properly credited. NASSP has permission to edit, publish, and copyright the submission. NASSP may republish the submission or any part of it in any future publication. Within a few days, you’ll receive an email acknowledging receipt of the manuscript.